Our stereotypes of ancient Egyptian dance involve awkward-looking poses with right-angle positions of the elbow and wrist. People assume that such images appeared on temple and tomb walls. But, did they? Here’s a look at some of the dance scenes appearing in temples and tombs in Egypt. The dancers in the photo at the top of this page appear on the west wall of the Luxor temple. If you look left to right, you’ll see that each image is bending back a little further. Think of these as individual frames in a movie, showing the motion of doing a backbend into a yoga wheel pose, or maybe doing the first half of a back handspring. Off to the right [not shown in this picture] there is a group of women playing sistrums (a type of rattle). This scene is part of a larger mural showing a joyous religious celebration, the Opet festival where the god and goddess are united for conjugal fun. This dance, though, is not considered a ritual religious dance (although those did exist in ancient Egypt). Instead, it’s more of an entertainment spectacle that was being performed for the pleasure of those who saw it. The Luxor Temple was built around 1,400 BCE, which means these images of dancers are about 3,400 years old. These dancers are not priestesses worshiping a goddess, but rather secular people who are participating joyously in the annual event. I kind of think of this as being like Christmas in our North America culture – there ARE sacred events related to celebrating Christmas such as church services and pageants, but there are also many secular celebratory activities such as children sitting on Santa Claus’s lap to pose for photos. This ostracon (piece of limestone painted with an image) was found at the Worker’s Village near Luxor, also known as Deir el-Medina. Archaeologists believe it was created between 1292 and 1076 BCE. Today, it resides in Italy, at the museum in Turin. It bears a strong resemblance to the dancers on the west wall of the Luxor temple. For more information about Deir el-Medina, the site where this was found, see my post about Deir el-Medina. Inside the grounds of the Karnak temple near Luxor, there is a chapel known as the Red Chapel of Hatshepsut. It features images resembling those of the Luxor Temple’s west wall. The top row shows the backbends. Off to the right is a harpist playing for them. The bottom row shows men dancing on the left, and women playing sistrums (a type of rattle) on the right. Archaeologists estimate this chapel may have been built around 1,400 BCE. Dancers in the tomb of Ka-Gmni at Saqqara, Egypt. April 18, 2018. 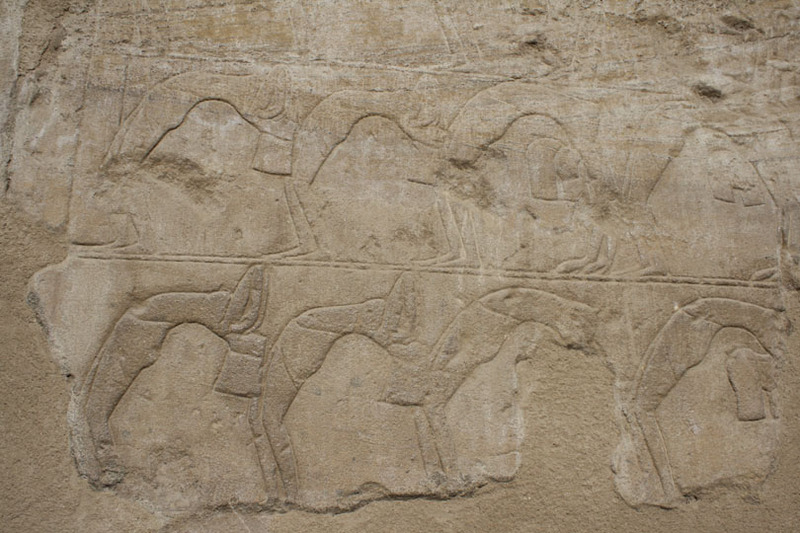 These dancers appear in the tomb of Ka-Gmni at Saqqara, Egypt. It dates back to approximately 2300 BCE, and therefore is one of the oldest known images of dance found in Egypt. See also my post about the image of men performing sacred dance at the Edfu Temple.